On a tennis court they are emerging as championship class: A sledge hammer serve and a torrent of effusive volleys. Doubles partners Rohan Bopanna and Aisam-ul-Haq Qureshi are also the flip side of a political crisis, deep and dividing, that has left bloody stains on both sides of the Indo-Pak border. To the people – chaiwallah to the connoisseur – their friendship is balm to old wounds just as their partnership reaffirms an old truth that we were one. The year in which they signed on as Ambassadors of Peace with the Peace and Sport foundation, an initiative of PrinceAlbert II of Monaco, Bopanna and Qureshi also turned the corner as a doubles team, shifting gear from competitors to contenders. Born 13 days apart in Bangalore and Lahore, the 30-year-olds claimed one title (Johannesburg) and made three finals (Napoli, Casablanca and Nice) this season. Last week in Washington they beat the heavyweight pairing, American twins Mike and Bob Bryan, to make the semifinals. The Indo-Pak combine are the 15th ranked team in the world and are in with a fighting chance of making the season-ending eight-team Tour finals in London in November. Ranked 33 and 35 in the individual doubles ranking, they have a slightly more difficult cut to make next week in Cincinnati, where they’re looking to make the Masters field. Their big date this month, however, is the final Grand Slam of the year the US Open, starting August 30th in New York. Mahesh Bhupathi, four Grand Slam men’s doubles titles and seven mixed-doubles crowns, said consistency will be the key in the coming months for Bopanna and Qureshi. He added, “They are a dangerous team, both of them have big games. What they need to do in the next three months is get some good results in bigger events so that they can make the cut for the Tour finals.” The partnership hasn’t come easy for Bopanna and Qureshi. They’ve fought great odds to get where they have. To begin, with the paths they embraced are vastly different. Bopanna, the younger of Prabha and Malika’s two children, hails from a community with a strong martial tradition. Coorg or Kodagu, Karnataka’s picturesque, coffee-growing district, gave India her first Chief of Staff, and Commander and Chief of the Military, in Field Marshal K M Cariappa and the fourth Chief of Army Staff in General K S Thimayya. There was a time when an entire regiment in the artillery division of the Indian army was made up of Kodavas. Prabha, a coffee planter, was also a fine tennis player in his youth. Like his son, he had a destructive serve, but lacked the warrior quality that lends an edge to the sporting skill sets which are integral to the heart of the Kodava. Prabha introduced his son to tennis and gave him a dream. As a pair they’ve been making the right noises this season. Bopanna, 6 ft 3′, whose game revolves around a booming serve, brings the flash and dash into the combination. He plays the ad court and is always looking to finish, preferably with a show of brute power. Qureshi, 6ft, lends a calming solidity to the team. He sends a lot more balls across the net, creating pressure and forcing his opponents into errors. The cementing factor of their partnership is their friendship. Bopanna said, “There’s nothing I cannot talk to him about.” Qureshi put it down to, ‘trust’ . “I have complete faith in him. If he blows a serve or volley or a forehand at a crucial time in the match, I know the intention was right. He’s doing the best he can for us as a team.” In a recent Facebook update, the Pakistani described his partner as, ‘my brother from another mother’ . At their peak, in the late ’90s, the Indian Express – Mahesh Bhupathi and Leander Paes, a spectacular weave of silken skills and modern methodology, competed with each other on the court, each pushing the other to greater heights and dazzling runs that showcased them as one of the greatest teams tennis had seen. Bopanna and Qureshi on the other hand hold each other up. Theirs is a bond which says team first and individual ability second. Qureshi argued that no one was perfect and that however much you may like a friend there may be stuff about him that you dislike. “I think with us we understand and accept each other’s weaknesses just as much as we appreciate our strengths,” he said. Two wonderful young men and gifted tennis players, whose speeches will always end with a wish for world peace. 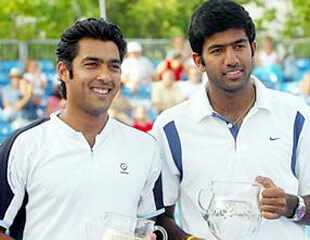 Bopanna and Qureshi are not the saccharine sweet contestants in a beauty pageant, they know what those words mean. They are men on a mission: Grand Slams and Goals.